Overnight gold markets stabilized and bounced back a tad as some bargain hunters emerged in the $1215-$1220 range and halted further declines in the metal. The trade is seen awaiting the release of the retails sales and consumer confidence numbers later this morning. One thing players did not have to wait for was Chinese inflation figures. They showed a stronger-than-anticipated gain of 3.1% in May, once again raising apprehensions that the country is overheating even before summer officially begins. Higher than welcome inflation rates in China raise the spectre of interest rate hikes and/or of the yuan being revalued in order to keep things from boiling over. It may possibly be late in that game however, as the world’s third largest economy heads for –or has reached- the point where surplus labour disappears and pushes wages and demand upward. That, in turn, raises the possibility that places such as Vietnam could see a rise in manufacturing activity that then might leave China on cost issues. The drama Mr. Soros referred to, is the one that will sink the world’s financial system ‘as we know it.’ Mr. Soros did not offer a vision of what financial system will succeed the one we know at the present time. As things stand this morning, a third week of gains is underway in the Old World, led by…Spanish lenders who are in the midst of a love-fest of pre-merger talks. Gold prices opened on the plus side this morning, gaining $5.30 per ounce and were quoted at $1223.00 as the action got underway. Book-squaring before the weekend could keep things on the boil as will the process of digesting the US economic data. The yellow metal is trending towards being range-bound as neither side is apparently willing to let things get beyond the broader psychological markers at $1200 and $1250 per ounce. Gold could find support at $1,210 and $1,203, while resistance overhead remains visible at $1,228 and $1,240 respectively. In the background, the dollar was last seen a bit lower at 87.05 on the index, while the euro remained above 1.21 against it. 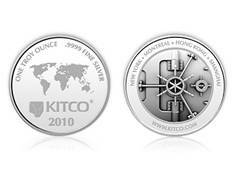 Silver prices opened firmer, with the white metal rising 21 cents to the $18.45 level. Platinum added $11.00 to open at the $1545.00 bid figure, while palladium showed a $2 rise at $452.00 the ounce. Ditto rhodium, which was quoted at $2390.00 after a small decline on Thursday. If you perceive gold to be a tad on the ‘rich’ side of the price equation, there are plenty of other metals (and other non-metallic commodities) that beckon. Our good friend, Myra P. Saefong reports so, from her Tokyo office at Marketwatch. So, give rhodium and soybeans a second glance, now that your core gold stash is secured. One market statistic that might not give gold bulls much to cheer about is the fact that the first trimester of 2010 saw a marked slowdown in the number of miners cutting back hedging. As is well known, de-hedging has been a robust contributor to the rise in bullion over recent years as producers saw little reason to fear declining gold prices and thus did the opposite of hedging. Barrick Gold actually euthanized its entire hedge book. Now, however, with only 780,000 ounces of gold being bought back by the industry in Q1, questions are once again being posed about what might come next. There are barely over 200 tonnes left in the global hedge book, and Societe Generale envisions about 100 of those being done away with this year. Based on last year’s pace, the entire remaining tranche could be gone by 2011. We’ve said it once, we will say it again. Short of an excuse to sell you some overpriced semi-numismatic coins (which, BTW, would ALSO be recalled in a dire situation – never mind the 1920’s) there is no reason to mention such nonsense. Capital flow controls-if that is what this is all about- are far easier to carry out using your (very well-known to the authorities) bank accounts, brokerage accounts, and such. No need to resort to the measly stash of bullion being held by Americans. You say you really want a bunch of gold to confiscate? Tell Indians to hand it over. Multiples upon multiples of tonnes are squirreled away over there. This writer suggests reading two reasoned pieces on the non-issue: one, by long-time, honest, coin dealer Bill Haynes over at Certified Mint in Arizona (here: http://www.cmi-gold-silver.com/gold-confiscation-1933.html) and the other by learned commentator Adam Hamilton over at Zeal Llc (here: http://www.zealllc.com/2004/hydra11.htm). Read and see the light. Then sleep better. Note the .9999 fineness, note the image of the vault door symbolizing safety. The essence of Kitco, in a tangible form. Fineness (of service) and safety (across the board) since 1977. Says it all. PS – We note with great sadness the passing of one of the pillars of the US precious metals’ retail industry. Veteran precious metals expert, and kind-to-the-core friend Glen Kirsch, passed away last weekend. His excellent team at Asset Strategies International, as well as all of us who knew him, will miss his presence. Sorely.